You are at:Home»News»Which are the Best Cruise Lines for Art Aficionados? Which are the Best Cruise Lines for Art Aficionados? Contemporary cruising is getting more stylish by the second. And it’s not just lavish interiors, state-of-the-art day spas, five star cuisine, world class entertainment, exhilarating on-board experiences and utterly unique shore excursions that lines are shining the spotlight on. Today, cruise lines have started to commission coveted art experts to curate amazing collections that take deck side décor to a whole new level. The trend has quite literally transformed some of the industry’s mega-liners into floating galleries showcasing priceless art sourced from across the globe. From sculptures and watercolours to silk screen prints and oil paintings, the collections are wonderfully diverse. Are you a self-confessed art buff? If so, read on for our guide to some of the finest at-sea art collections on the planet! Celebrated Dutch architect and urban planner Frans Dingemans custom designed every interior of the Holland America Line fleet. In his trademark flair he peppered spaces with beautiful artwork and antiques designed to give the ships a luxurious feel that echoed the line’s historic significance. The result is an intriguing blend of contemporary, modern and conventional art underpinned with an up-to-the-minute glamorous edge. On the Amsterdam, a team of Pietrasanta artisans created an expansive marble table crafted from stone sourced from the same town Michelangelo purchased his materials. A marine themed fountain imagined by Italian artist duo Lebigre and Roger graces the decks of the Ryndam while the Veendam features spherical ceiling murals painted by Irish artist, Wout Muller. For sports and pop culture buffs, other fleet members boast signed baseball bats from legendary players such as Joe DiMaggio, original works from Andy Warhol and Roy Lichtenstein, iconic snapshots of Paul Newman and Elvis, signed guitars from the Rolling Stones and Queen, as well as medallions won by Frank Lloyd Wright. Britain’s flagship line celebrates its 175th anniversary this year and artwork played an integral role in helping the company commemorate. As part of its festivities plans the line sourced an impressive collection of contemporary British works to honour the Queen’s reign as the first modern monarch of England. The resplendent Queen Victoria now boasts a remarkable art collection worth in excess of US$2 million. Standout pieces include a series of dog sketches from Victoria and Prince Albert, a one of a kind clock crafted by the makers of Big Ben and a duo of leaded-glass ceilings that cast a beautiful light over the casino and library. Passengers wanting to gain an in-depth understanding of the collection can sign up for an art tour. Founded in 2002, this modern line has since become synonymous with having one of the finest at-sea art collections on the planet. Over a series of years the impressive collection was personally sourced by founders Frank J. Del Rio and Bob Binder, and is now showcased across the fleet. The pieces are definitively museum worthy, with ships such as the stately Riviera housing sixteen signed and numbered Picasso lithographs. Other highlights include artwork by Joan Miró and Damien Hirst. To celebrate the line’s artistic infatuation, Del Rio and Binder have released a 200-page book titled The Oceania Cruises Art Collection which offers readers an in-depth glimpse at the curating process, as well as over 2000 photographs of the line’s works. On-board the Baroque-inspired S.S. Maria Theresa, passengers will find a cherry picked selection of art that celebrates the rule of Maria Theresa, the Habsburg dynasty’s only female ruler. A 10 foot tall oil painting of the sassy sovereign hangs over the grand staircase, accompanied by lavish upholstery, draperies, four poster beds, antiques and French balconies throughout the ship. As plenty of Uniworld River Cruises are already ardent art fanatics the line places a heavy emphasis on putting together highbrow collections that are guaranteed to impress even the most well-heeled of collectors. As part of its Art at Sea programme, Royal Caribbean has sourced an eccentric collection of works showcased on its ships. When Quantum of the Seas set sail, passengers were wowed with the ship’s in-house art theme, What Makes Life Worth Living. The exhibition encompassed 2,980 pieces and was worth an estimated $5.2 million. 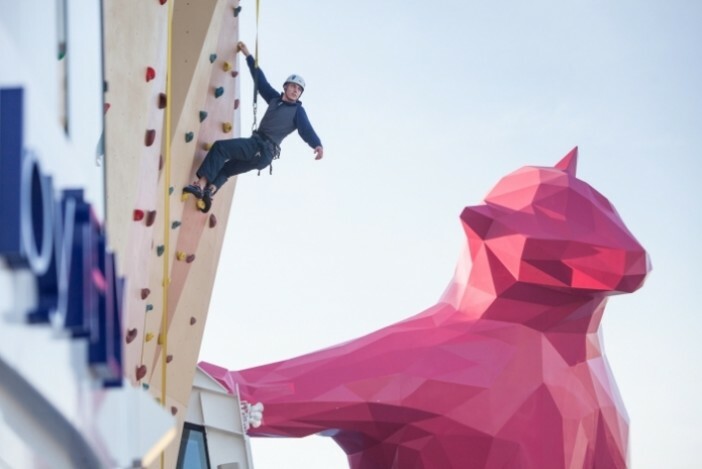 A larger than life magenta polar bear titled ‘From Afar’ is one of the most eye-catching pieces, dreamt up by Australian artist Lawrence Argent. On Oasis of the Seas passengers can sign up for art tours and auctions presented by contemporary art appreciation group Art Actually while an ever changing ‘Art Space’ showcased a dynamic collection accompanied by wine and cheese parties. If you’d like to take an art tour with these cruise lines personally, we can help at Cruise 1st! We specialises in finding the best cruise deals from all over the world. Our expert cruise consultants are available seven days a week. Get in touch today and discover your perfect cruise holiday!